Pricing is a top concern for most business owners, service people, and sales people. Today, I’m going to tell you the truth about pricing. The dirty little secret people don’t want you to know. It may seem like I’m taking a while to get to that point, but I want to build the foundations that will create those ah-ha moments for you. I recently returned from the eWomenNetwork conference for female entrepreneurs in Dallas, Texas. I was so inspired by the conference, that I wrote the first draft of this show while flying home on the plane. Price isn’t always what matters most to your potential customer. It is how you phrase the price and whether you get your customer excited. Today, I talk about the subconscious, using the senses, having three price points, and how to combine these tactics to increase sales. CLICK THE IMAGE FOR YOUR FREE DOWNLOAD! [04:13] One thing I love to watch at conferences is how people position their offers or services. [04:32] It’s fascinating to watch the true masters when they sell from stage. [05:30] Next week’s episode digs into using behavioral economics to become a better presenter. 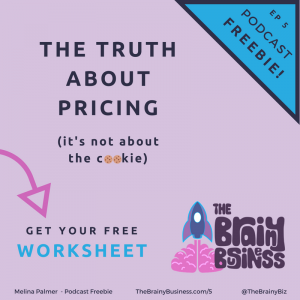 The concepts are all built on pricing which I demystify for you in this episode. [06:11] Molina is constantly questioning the world around her. Everything is a learning opportunity. [07:21] When I’m consciously examining an advertisement, I’m not really aware of what my subconscious is taking in. [07:43] 99% of our brains processing is subconscious. [09:08] The joy in our brain happens in the anticipation phase not when we get the item. [09:34] The smell of chocolate chip cookies will get your subconscious brain very excited. By the time you arrive to store, you may not be able to resist the temptation of the cookies. [10:45] The importance of the order in which things happen. [12:28] How your conscious brain will unwittingly give in to the will of the subconscious. [12:49] This cookie example is an example of an expert and a novice selling technique. Even if the cookies were expensive, you had already bought them in your mind before you walked in the door. [14:10] Masters of selling will get you excited about selling anything in any medium. [14:44] Melina considered a membership site before deciding on a podcast. [15:59] You want to hear in my campus next piece of information. If you are solving a real problem for your customers in a way that they can understand, they will find a way to pay for it. [16:39] You just need to draw them in with your own take of fresh baked cookies. [16:57] People need to understand the importance of behavioral economics before they care enough to take any step that will cost them money. [18:33] The scent of the cookies needs to come first. Like the information broke down into a free podcast. [18:43] What is your item that gets people to stop and want more? This is the top of your funnel the podcast, the billboard the Facebook or Instagram post. [19:46] If you start out with price people will already tune you out and move on. [19:59] What will draw your clients subconscious in to flag their conscious to be interested in your product? [21:01] Make sure whatever tactic you choose is on point with your brand and your offer. [21:24] How can you incorporate one of the five senses into your business to make it stand out? [22:18] What is your lead magnet? If it’s a food item, give your customer a free sample. [23:14] Loss aversion and perceived ownership. [23:31] Our brains are hardwired to latch onto things and not want to lose them. Our brains claim ownership incredibly quickly and do not want to give things up. This is greatly increased with the power of touch. That’s why with the furniture example it’s good to give them something to touch. [24:06] The overnight test drive is a great example of this. [25:27] Involving the senses can help stimulate the brain’s ownership response. How can you do this with your business? [26:22] The concept of scarcity. FOMO or fear of missing out caught on for a reason. Notice the countdown clock next time you buy something. Can you fill your anxiety spiked? [27:59] These countdown clocks trigger something in your subconscious brain. [29:20] Studies show that phrases or offers that rhyme or sound good are more convincing. [31:09] Framing is everything. It’s not about what you say it’s how you say it. It’s not about what you sell it’s about how you sell that. [31:22] All of the stuff that leads up to the offer and the pricing matters more than the numbers themselves. [31:43] How to present the item price. [32:22] A study done with grocery store end cap displays. Buy 18 Snickers resulted in a 38% sales increase. The number stands out to your subconscious brain. [34:28] When asking people for money, start with a high number first. [35:17] The concept of relativity. [38:15] Provide three options when setting prices. Take your best offer and list out the value comparisons. Build a decoy item. This should be very similar to your best offer, but with an obviously worse value. Incorporate a third item to provide balance. [41:42] To be a master of selling, you need to understand how these principles work together and which ones to use in your particular situation. [42:20] This is where I can help you. Using these tools, you will see benefits when you start to incorporate even one or two of them into your strategy. [42:27] I also offer a free worksheet to help you build these out yourself. I would also like to help you. Please check out my Product Sales Sheet. [44:28] If you click on work with me on my website, I also offer a free 15 minute consultation. Thanks for listening. Don’t forget to subscribe on Apple Podcasts or Android. If you like what you heard, please leave a review on iTunes and share what you liked about the show. 3. Do Lead Magnets Work and Do You Need One?